The Operation Task is the function to define the movement of the items at both the IN and OUT screen under the Inventory Module. For example, when the user IN the item, he/she would like to define where is the item receive from: - Received From Supplier, Returned From the Customer and etc. Therefore by making use of the Operation Task, the movement details can be stated clear. The same also works in the OUT screen. Before defined the Operation Task for both the IN and OUT screen, the user must first set the Operation Task name. 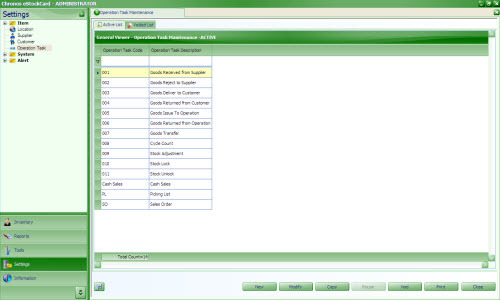 By default some of the tasks are available in the eStockCard Inventory software. 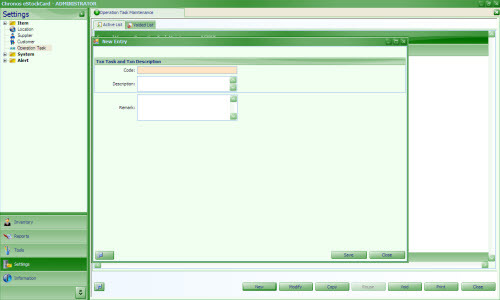 For the unavailable tasks, the user can create a New Task for their operation. Setp 2 Enter the relevant Operation Task Code and the Description for it. The code can be either alphanumerical. How to use the Operation Task at IN and OUT screen for the eStockCard Warehouse System? How to search for Item at Operation screen on the eStockCard Warehouse System?